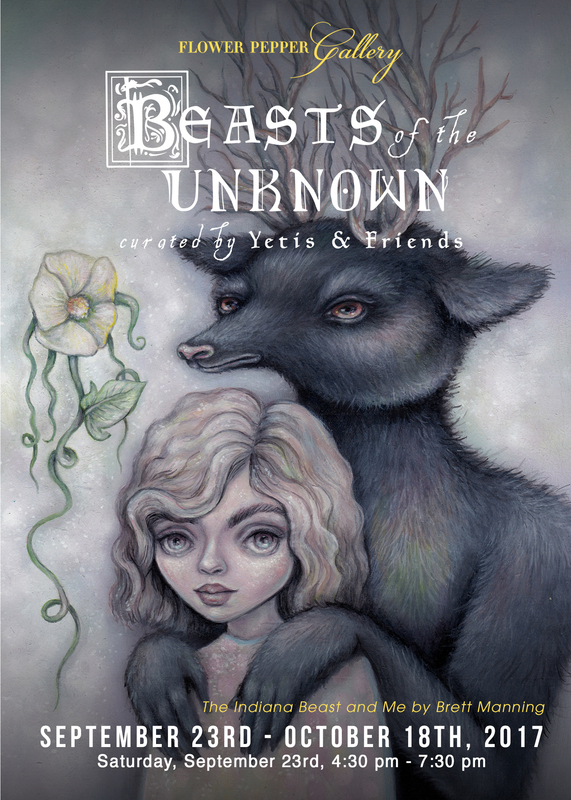 On Saturday, September 23rd, Flower Pepper Gallery is pleased to present, Beasts of the Unknown curated by Yetis & Friends. This fantastical group exhibition showcases not-so-everyday creatures that delight and awaken the imagination in all of us. Tall tales speak of beasts of legend. Whispers by the campfire warn of what lurks in the shadows. Whether gigantic or minuscule, intimidating or friendly as can be; throughout history, imagination has known no limits when it comes to dreaming up the most fantastic creatures. Wondrous monsters have fascinated people for generations and acted as spirit guides, protectors, or eerie warnings to describe phenomenon that could not yet be understood. This exhibition celebrates them all and there is no telling which fascinating beasts will make an appearance. Whether it’s the charming sculptural work of Daria Lapto and Zoë Williams, or the alternative taxidermy stylings of Sweaty Taxidermy and Valency Genis, there is a creature for everyone and they can’t wait to meet you. Stop by and say hello to all of the Beasts of the Unknown, and who knows, maybe one will just beg to go home with you! Many thanks to Zach of Supersonic Art for featuring Beasts of the Unknown! Click here to read. Thank you to Wall Street International for featuring the show! Click here to read.